Barbarians at the Gate: James Garner dances MWS to Vern Weese's calling. Bound for Glory (the life of Woodie Guthrie): Bob Osgood, Sets in Order publisher, calls. A Christmas Carol (Alistaire Sim version). Christmas in Connecticut (1945): Barbara Stanwick and Reginald Gardiner do Virginia Reel. Sidney Greenstreet does Texas Star (badly). Copper Canyon (Ray Milland, 1950): 40 seconds of Les Gotcher calling "Left to your partner, reverse allemande, Right to the corner right and left grand." from Gotcher's book. Destry Rides Again (1939): Jimmy Stewart and Marlene Dietrich dance a two-couple doseydo. Duel in the Sun: Lloyd Shaw calls Lady Round the Lady and the Gent Around Gent. Ethan Frome: Chorus Jig and Virginia Reel. Four Weddings and a Funeral: Dashing White Sergeant?. Giant: sounds like Herb Greggerson calling Texas Star. Hillbilly Hare: Bugs Bunny (Mel Blanc) calls. Indiscreet (1958): Cary Grant and Ingrid Bergman dance Eightsome Reel, a Scottish square. My Darling Clementine: Virginia Reel. Henry Fonda dances a waltz. Sheriff of Cimarron (Sunset Carson, 1945): 30 seconds of dancing. Star Spangled Rhythm: Texas Star and Sides Divide (Heads forward, Sides divide, Swing in the center and swing on the side). 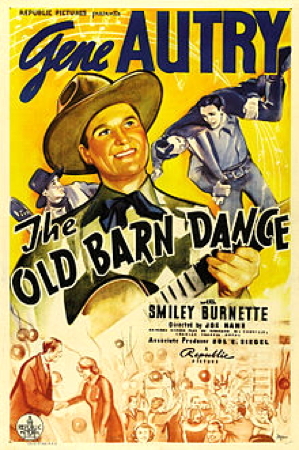 The Old Barn Dance: Gene Autry and Smiley Burnette. War of the Worlds (1953) Gene Barry dances: Heads promenade 3/4, Sides arch, Heads duck under, RH star in the middle, Allemande left with corner. Welcome Stranger: Bing Crosby calls Texas Star. Mr. Pastry's quadrille dance (Lancers) for one, filmed in 1950s and 1960s and popular on the Ed Sullivan show. Mr. P., in white gloves, tails and all, would be on stage alone, as if in a square. When the music started, he'd stand and nod his head, counting beats, waiting to do his part of the dance. If the move was "circle left," he'd move to the left as if being pulled along by the "other dancers." On "circle right", he'd be jerked along in the opposite direction. If the move was "grand right and left, his head would snap back on each pull by. Then he'd stand and nod his head some more, nervously counting beats.